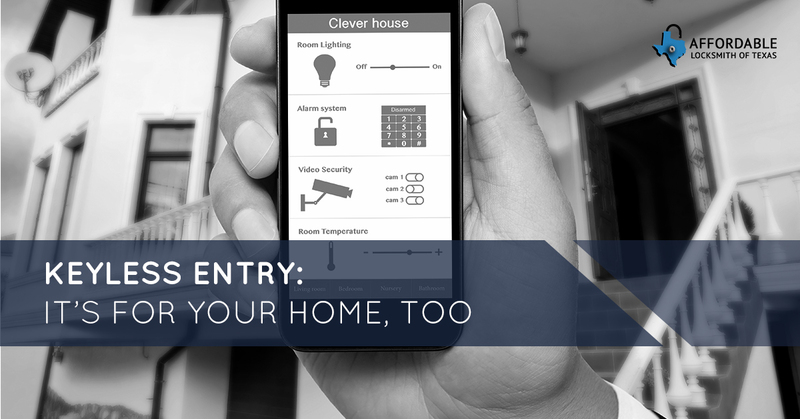 Keyless Entry: It’s For Your Home Too! When you hear about keyless entry, perhaps you immediately think of your car’s security system. Or maybe you think about businesses, such as hotels, that use key cards for entry. Keyless entry is becoming more and more affordable and isn’t just for businesses or your car: Many are opting for keyless entry for their homes in The Woodlands because of its affordability and the many advantages that electronic locking systems have over the traditional key and deadbolt locking systems. So, what are these advantages? Keyless entry comes in a variety of types, including keypad and FOB-operated locking systems. Having keyless entry, and more specifically, a key FOB, can be incredibly convenient, especially when you have your arms full after a trip to the grocery store or when you are leaving in a hurry with your kids’ lunches in your arms. Simply wave your key FOB near the lock and enter your home. If you have kids, an electronic keyless locking system can be incredibly helpful. If you opt for a keypad lock system, you never have to worry about your kids accidentally losing their keys and being locked out till you’re able to get home. Also, if your keyless entry automatically locks behind you, you may never have to worry about your kids forgetting to lock the door when they leave home. A key FOB is still a great option for kids: Instead of them fumbling with keys, trying to figure out which key they need to use or struggling to open an old stubborn lock, they can simply use their key FOB and quickly get inside. Do you have a large household, or perhaps you have a nanny or maid service that needs access to your home throughout the week? Keyless entry for your home could be a convenient alternative to traditional locks and the need for multiple key copies. Avoid the cost and security issues of key copies and install keyless entry in your home. To use your keyless entry and have effective security, you must employ common sense security measures. The first, and a very obvious tip, is to keep your key code a secret. If you have children, stress to them the importance of keeping your code a secret and when using a keypad, standing in such a way that onlookers have trouble seeing what the code accurately is. If you do have a breach of security, know that your key codes can be easily changed. Secondly, many keyless entry systems require batteries to function. Our locksmiths suggest that you set up reminders on your calendar or phone so that you will never be locked out simply because your locks or FOBs are out of batteries. Keyless entry has many advantages for homeowners in The Woodlands. If you are interested in learning more about keyless entry, whether it is a good option for you, and other security options to keep your home safe, contact the locksmiths of Affordable Locksmith of Texas! Our locksmiths have years of experience and knowledge about the traditional and cutting-edge home, business, and auto security technologies. Learn more about our services we offer The Woodlands here! First-time clients get 10 percent off their first service! Locked out? Call us! We will respond to you within 15 minutes day or night.